#2, during a switch move, April 28, 2001. EJ&S #2 in storage at North Freedom, April 2000. 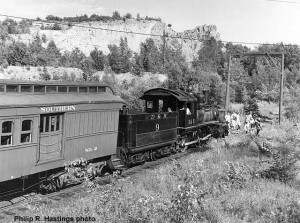 #2 at North Freedom, c.1964. 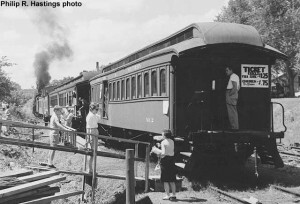 #2 at North Freedom, July 1964. Ron Jones photo, MCRM collection. 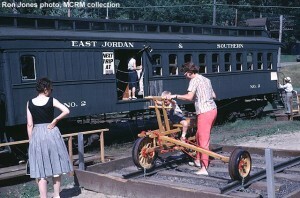 EJ&S #2 uptown, serving as ticket office, August 1963. Pete Gorman photo; Ron Jones/MCRM collection. #2 as ticket office, North Freedom, 1963. Philip R. Hastings photo. 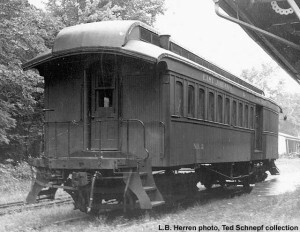 #2 while in service at EJ&S, location and date unknown; L.B. Herren photo; Ted Schnepf collection, from Paul Swanson. The history of this car has been elusive. 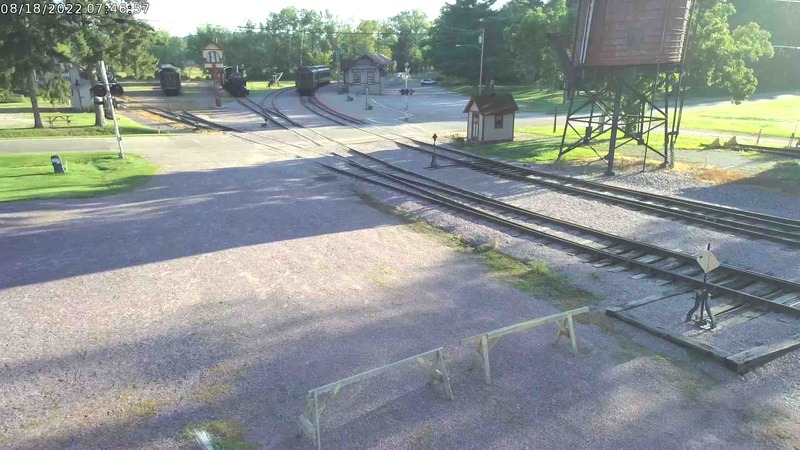 It was the second coach acquired by Mid-Continent (in 1963) and is believed to be the oldest piece of equipment in the collection. 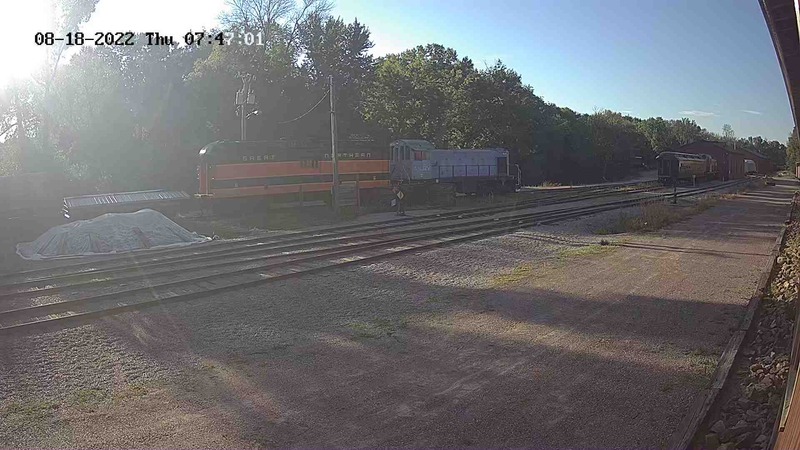 Built by the Osgood Bradley Co. of Worcester, Massachusetts in November 1864 for the Grand Trunk Railway as their #112, the car was renumbered to 585 in November of 1885 and in 1889 the car was rebuilt at the Chicago & Grand Trunk, Gratiot Shops in Port Huron, Michigan. 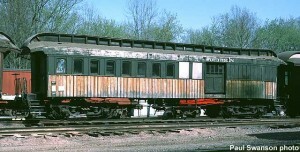 In 1902 the coach was sold to the Michigan shortline East Jordan & Southern by the F. M. Hicks of Chicago Heights, Ill. While on the EJ&S, the car was rebuilt into a combine. It served for nearly sixty years there and was sold in 1961 to a private individual and two years later ended up at North Freedom (the car came to North Freedom across Lake Michigan on a car ferry). 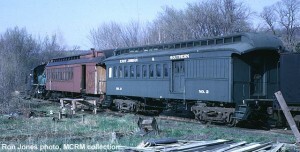 #2 was used in the museum’s early passenger trains in the 1960s. 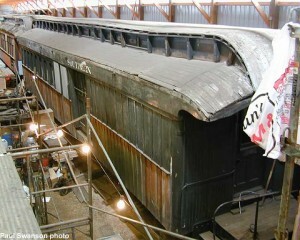 Today, it is stored inside the Car Shop and is currently undergoing restoration. 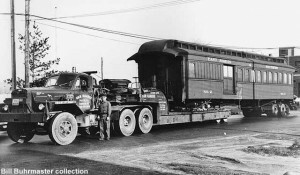 The age and builder of the car make it a unique part of Mid-Continent’s wooden coach collection.